BNN offers a summary of this week’s topical news in a variety of categories: Future; Fight; Announcement; Change; Growth; Discussion. Latvia may completely cease using the mandatory procurement component system, as confirmed by Economy Minister Arvils Ašeradens. This proposal was supported this Wednesday by the ministry’s work group that has worked on ways to cancel MPC system these past several months. To abolish the system, the ministry proposes restoring subsidized electricity tax at 15% in 2019 and establishing new requirements for biogas plants on minimal food waste and other organic waste ratio. It is also planned to reform power output payments, forming changes to its administration, establishing a requirement for power stations to include ancillary services to the transmission system to reduce consumers’ payments. Bribery accused governor of the Bank of Latvia Ilmārs Rimšēvičs intends to name his replacement in the European Central Bank Council. However, doing this is impossible at this time, because he first has to contest the decision of the Prosecutor General’s decision in regards to the investigation, said Rimšēvičs’ lawyer Saulvedis Vārpiņš. Defence believes Latvia’s has failed to complete European Union Court’s order on interim injunction, because approval of a new representative is legally impossible in a situation when the governor or the Bank of Latvia remains applied with a security measure – restriction to perform his duties, said lawyer Saulvedis Vārpiņš. Approval of a replacement member of the European Central Bank differs from simple provision of authority, because the governor of a central bank first has to be able to access information system and information about developments on the world’s financial markets, said Vārpiņš. 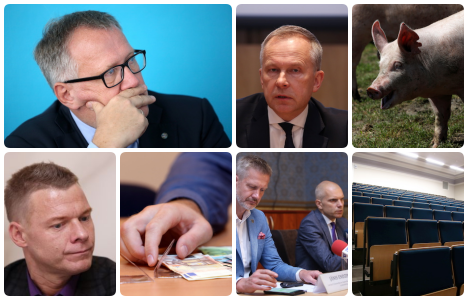 Before approving a replacement representative in ECB, the governor of the Bank of Latvia needs to have access to matters discussed during meetings of ECB Council, as well as meet with central bank’s specialists to discuss positions in certain matters, added Vārpiņš. «Unfortunately, instead of approving a replacement in ECB to ensure continued function of the organization, Rimšēvičs if forced to appeal the decision made by the Prosecutor General in court,» said the lawyer. «Concentration of PM10 particles in air in Ventspils does not exceed the average index across Latvia, which means the air in the port city is not worse than average in Latvia,» says SIA Estonian, Latvian & Lithuanian Environment board member Aiga Kāla. BNN had previously reported that the topic of air quality has been a very hot topic in Ventspils these past couple of weeks. Many complaints have been received from Ventspils residents about the presence of coal particles in the air, which can be explained with unusual weather conditions in the city. Other complaints detail the horrible smell coming from SIA Bio-Venta. On 31 July, representatives of Ventspils Commercial Port (VCP) and State Environment Service decided to meet with residents of Ventspils. «There is a lot of misleading information reported by the media in relation to dust and the effect it has on human health. Those are coal (not dust) particles. They are 10 μm larger than dust particles and cannot enter the human body. Therefore they cannot impact human health,» said SIA Estonian, Latvian & Lithuanian Environment board member Aiga Kāla at the beginning of the meeting. She added that «large particles visible with the naked eye can cause some discomfort, but they do not end up in our lungs». To fix this situation, Ventspils Commercial Port considers using snow cannons to create a fog-like barrier from the side of the docks. VCP Technical Director Māris Lieģis said during the meeting that the port also has plans to set up more platforms with snow cannons to create the ‘water wall’. He mentioned visiting Klaipeda, where his Lithuanian colleagues also tried using snow cannons in summer. Representatives of the State Environment Service stressed time and time again that no environment pollution is found in Ventspils. «As confirmed by Ventspils regional environment office, there have been ten cases of PM10 particle concentration exceeding permitted levels at the coal loading complex in the first six months. Not a single case was registered in July. Permitted concentration level of PM10 particles in residential areas is 50 μm/m3. The highest concentration level recorded in Ventspils in July was 21.7 μm, and it was recorded only once. In other days, concentration levels varied from 3.1 μm to 18.7 μm. This means no pollution was recorded in Ventspils,» as BNN was previously told by State Environment Service deputy director general Aina Stašāne. Measurements are provided by Latvia’s Environment, Geology and Meteorology Centre’s laboratory and State Monitoring Network, which provides data monitoring. Environment, Geology and Meteorology Centre is responsible for air quality measurements across all of Latvia, as well as maintenance of observation stations, performance and quality of measurements. Can the State Revenue Service be trusted? Who benefits from SRS remaining with no head? Do people see any point in paying taxes, and why is it necessary to take care of SRS employees? BNN asked acting SRS director Dace Pelēka. Why is it so hard to find a director general for SRS? Latvia’s State Revenue Service was founded in 1993. For 25 years the institution has been monitoring taxes and taxpayers. According to Dace Pelēkā, Latvia’s SRS is a multi-functional institution. However, the seat of the head of SRS has remained vacant ever since the unexpected passing of the last SRS director general Ilze Cīrule in March. Dace Pelēkā admits the last director of SRS Ilze Cīrule, who had entered the service with new ideas, had provided employees something of a shock therapy. Nevertheless, in certain matter she asked questions no one else had asked before her. «After years of working in state administration, it became necessary for us to look at certain matters from a completely different viewpoint. Now that SRS has no director, we continue what was started during Ilze Cīrule’s term, because the tasks entrusted to us are challenging and require a lot of time.» She adds that SRS has not stopped for a moment in its work and development in the past half-year. As of 7 July 2018, the ratio of deposits from risky shell companies in Latvia’s banking sector was 0.03%. Most of this amount consists of the remaining balance of funds exiting the country, as reported by Finance and Capital Market Commission. 9 May marked the coming into force of amendments to the Law on the Prevention of Money Laundering and Terrorism Financing, which required participants of Latvia’s finance sector to cease working with businesses that fit two signs of shell formations – perform no actual business activities and have no economic value, or be registered in a country that has no requirement for submission of regular financial accounts. «Now we can safely say our banks have performed their task to the letter. Only 0.03% or EUR 4.5 million is left – the money blocked on frozen accounts that require additional checks to determine their origin. We can clearly see the work that commenced in 2016 still continues. The proportion of risky clients continues reducing every day, because banks continue terminating ties with shell formations that are not prohibited yet but still carry certain risks for banks. We can conclude that in relation to shell companies, and not just their prohibited types, around EUR 1.5 billion have left Latvia’s banking sector in the first half-year of 2018. Cooperation has been denied to more than 9,000 different kinds of shell companies,» says FCMC chairman Pēters Putniņš. Finance Ministry has reached a conceptual agreement on applying on restaurants a reduced 12% value added tax rate instead of the current 21% under the condition that catering companies are to cease paying employees envelope wages, LNT reported on Wednesday, 1 August. Catering companies have been trying to secure tax benefits for a long time now. Jānis Jenzis, president of Association of Hotels and Restaurants of Latvia, said the excessive tax burden has already caused the closure of some prominent restaurant in Riga. Estimates from Finance Ministry show that more than 40% of people employed in the industry are not even paid minimal wages. For there to be a general agreement regarding the minimal wage level for people employed in the industry, the document needs to be signed by companies that together employ at least half of people working in the industry and whose total turnover exceeds half of the entire industry’s turnover. The president of the association said he hopes the signing of the agreement is a matter of time. Finance Minister Dana Reizniece-Ozola said reduced VAT may be applied to the industry only if catering companies cease paying envelope wages. «If the industry signs a general agreement detailing a specific wage level for each profession, then we could conceptually support reducing VAT,» said the minister.